It goes without saying that I have been blessed to be able to travel all around the United States and the world. There have been a lot of flights through the years, but there has only been one other time when I had to use my athletic skills to sprint across an airport to catch a flight. My recent trip to Edinburgh, Scotland was time No. 2. But in all seriousness, I’ve had 30-minute connections go smoothly, so I wasn’t too worried. That is, until I got a notification the next day that my first flight was going to be delayed a half hour. That’s 30 minutes, and 50-30 is 20. Yikes! I would only have 20 minutes to connect to my international flight. I was just going to be in Edinburgh for a short time, just a long weekend, and I did not want to burn up one of my valuable days in Scotland by sitting or possibly even sleeping in an airport in the USA. This did not sound like a good plan to me, but I went along with it. There was nothing else to do. As I walked to my seat, sweat dripping down my face, I offered up a simple prayer, thanking God I made my flight. I was sure there was no way my luggage would arrive with me, but I didn’t care. I had packed my running clothes in my backpack (a lesson I learned after a disastrous trip to Paris –which you can read about in my book). My race times may not be improving, but I am becoming a smarter traveler. I’ve had just a handful of trips that flow miraculously well from start to finish. 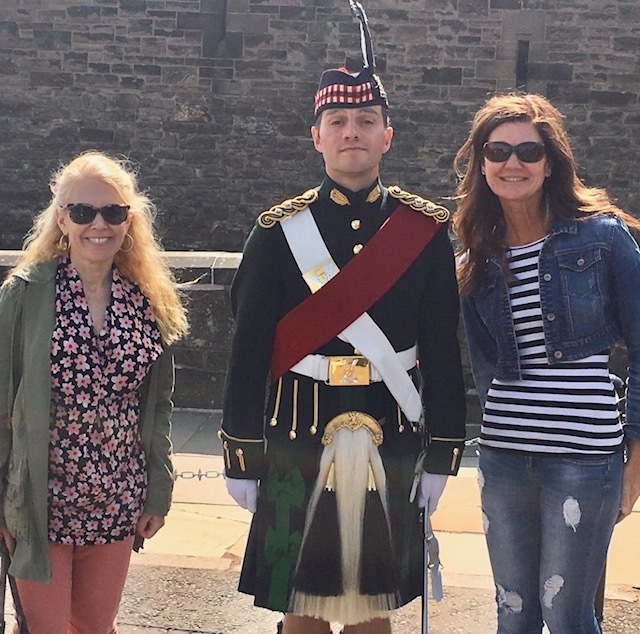 My trip to Scotland was one of these trips — not counting that airport sprint, of course. When I arrived in Edinburgh, I walked to the luggage carousel. Surprise! My large, red suitcase was one of the first to have been unloaded from the plane. It was a trans-Atlantic miracle. My trip continued with a fun taxi ride to the city center. I had booked a hotel on the iconic Royal Mile, a very touristy but important historical part of Edinburgh. My driver, who had a thick Scottish accent –so thick I had trouble understanding him- teased me that I was pronouncing “Edinburgh” like a German. Apparently, the correct pronunciation is “Edinbraw.” He is exactly right. That is how the Scottish say the name of their capital city. Now, I’m wondering how I should pronounce the town in which I live in – Newburgh, Indiana. Should I be saying “Newbraw”? The following morning, I did two more tours: an early morning running tour of the city (probably my favorite tour), as well as a tour of the Scottish Museum. After these tours, I met up with some friends from my hometown in Indiana. 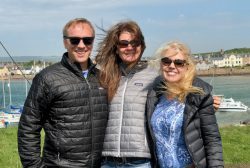 Like me, this couple was flying in to experience Scotland and run the marathon. We had planned in advance to stay in the same hotel and to do some sightseeing together. A trip is always more fun with the company of good friends, and I’m so thankful the McMillens came on this trip. They are a dynamic couple whom I admire greatly. They have been married 28 years and still seem to be head over heels in love –almost like giddy teenagers – all these years later. I’m also quite fond of them because we share the same passion for travel and fitness. Safe to say, the McMillens’ arrival into “Edinbraw” took the fun factor of my trip up quite a few notches. We shared a wonderful afternoon exploring Edinburgh Castle and eating dinner together. 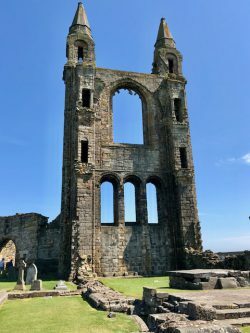 My most memorable time spent with them, however, occurred on an excursion we did the following day: an all-day trip to St. Andrews and Fife. This trip, as well as our tour guide, Ewan, did not disappoint. The scenery in the coastal towns that made up our tour surpassed my wildest expectations. When we returned to the Edinburgh city center after our day long adventure, we decided to eat a pre-race dinner together in a local pub on the Royal Mile and then said goodnight. We all needed to get to bed early. 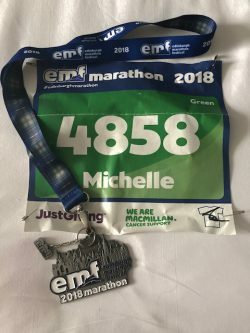 The next day was race day – the 2018 Edinburgh Marathon – the reason (or excuse) behind our trip. Although the marathon did not start until 10 a.m., (which is typical European late race start fashion), we were all feeling a little off in our adjustment to the six-hour time change between Scotland and Indiana. A good night’s rest before the race was very welcomed and needed. As I made my way back to my hotel, I felt happy – deeply satisfied. Though my race times still are not quite where they were before my running hiatus due to my injury, they are headed in the right direction. My 4:08 finish time was my fastest since my return to running. I’ll happily take it. But even more important than my finish time, was the whole overall experience. Once again, I would like to thank my husband, Allen Walker, for this wonderful gift of an unforgettable trip and race. Forever, I will remember the great country of Scotland; its lovely people; and my run along the spectacular coastline.